Marquis Abraham Duquesne (1610-1688) was an admiral in the Swedish navy from 1644 to 1647. He served in the French navy during the Dutch wars and defeated the combined fleets of Spain and Holland in 1676. In 1681 he received the title of marquis, though his Protestantism prevented his being made an admiral. In spite of the revocation of the Edict of Nantes in 1685, he was allowed to retire in peace. Pierre André de Suffren de Saint-Tropez (1729-1788) was a Knight of Malta and an admiral in the French navy. In 1781 he was sent to India where he engaged the British squadron off the coasts of India and Ceylon and destroyed it. 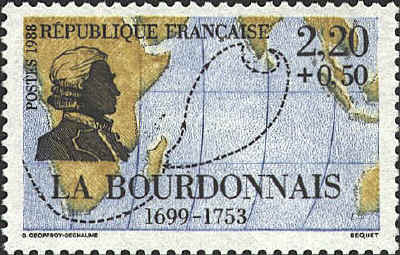 While he was in the service of the French East India Company Comte Bertrand-François Mahé de La Bourdonnais (1699-1753) took part in the capture of Mahé on the Malabar Coast of India. 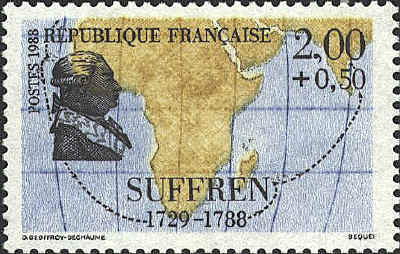 He was governor of the Île de France (Mauritius) and Île de Bourbon (Réunion) until he was put in command of a French fleet in Indian waters. He defeated the British forces in two engagements and blockaded Madras, but was removed by the governor-general of French East India and returned to France. He was acquitted of charges of corruption in 1751. Louis-Antoine de Bougainville (1729-1811) went to Canada in 1756 as aide-de-camp to General Louis-Joseph de Montcalm during the French and Indian War. In 1763 he left the army for the navy and established a French colony in the Falkland Islands. 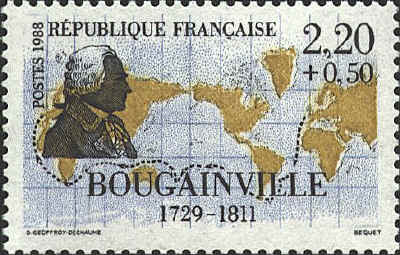 In 1766 he was commissioned by the French government to circumnavigate the earth. Three years later he returned to Saint-Malo, having lost only seven men. 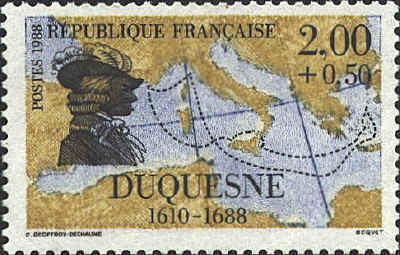 He was chef d’escadre (commodore) of the French fleet off North America in support of the American Revolution. He was made a senator, count, and member of the Legion of Honour by Napoleon. The largest of the Solomon Islands, a strait in the New Hebrides, and the plant genus Bougainvillea were named for him.